Representatives of the US embassy and a number of international organisations were allowed to visit Yelena Urlayeva, the chairman of the Human Rights Alliance of Uzbekistan (HRAU), in her hospital room. However, there is no clarity as to justifications for subjecting her to forced psychiatric treatment to date, the Tashkent-based rights advocate’s relatives told Fergana. Background: On March 1, 2017, Ms Urlayeva was forcibly placed in the psychiatry department of a Tashkent hospital. At that, she was taken there by police officers, who have had arrested her for no reason and were rude in their behaviour. Ms Urlayeva has told about the circumstances of her arrest in a videothat was recorded in her hospital room. On either Monday or Tuesday of this week, representatives of the US Embassy in Uzbekistan as well as employees of the International Finance Corporation (IFC), a member of the World Bank group, CAO Ombudsman Scott Adams visited here. Fergana’s freelance reporter Timur Karpov visited the hospital on March 9. The clinic employees did not allow him to visit the patient, having said the official visit days are Wednesdays and Saturdays per the head of Department 9 of the clinic. According to information in Fergana’s possession, the medical institution administration has not provided any information as to Ms Urlayeva’s arrest and forced treatment to interested parties, i.e. her relatives and foreign guests. Our office, too, was unable to obtain any answers from the hospital administration even though we have repeatedly phoned the reception and registrar. In accordance with the Uzbek legislation, a person may be placed in medical treatment facility in one of the following three cases: when a decision to this effect is 1) a voluntary decision; 2) relatives’ decision; and 3) a court ruling. According to Denis, Ms Urlayeva’s son, his mother can be held at the medical institution for at least one month. Ms Urlayeva has already been forcibly placed in this psychiatric clinic before in 2001, 2005, 2012, and 2016. International organisations have repeatedly stated she was subjected to “punitive psychiatry” and demanded her release. She has announced a hunger strike to protest forced treatment in 2005. In addition to confinement in the clinic, the authorities have put up numerous obstacles to block Ms Urlayeva’s efforts. She was attacked by unidentified individuals during pickets; she was beaten up; she was prevented from leaving her flat. This time around in March 2017, she was forcibly placed in said hospital just ahead of a meeting with several representatives of international organisations in Tashkent. According Umida Niyazova, a Berlin-based human rights activist and the head of the Uzbek-German Forum for Human Rights, Ms Urlayeva was planning to meet with a delegation of the International Trade Unions Federation on March 2, and then meet with Ombudsman Scott Adams this week. “I have known Yelena for over 15 years,” Ms Niyazova says. “She is a very sincere person—perhaps too sincere. She rushes to help anyone who comes to her [seeking help]. We have lost count of how many times she was arrested and beaten. I remember very well how a secret service officer has dealt strong fist blow on Yelena’s stomach right in front of my eyes 15 years ago. Yelena couldn’t breath. Her life is full of stress and sometimes she does need psychiatric help. But that does not mean he advocacy for human rights and statements are of lesser importance because of this. 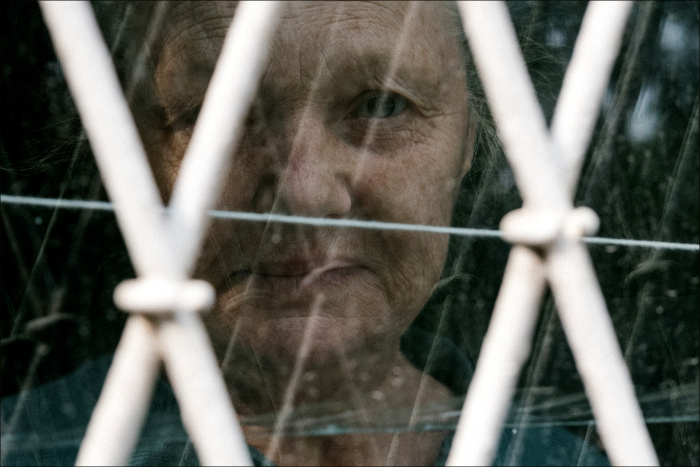 The most disgusting aspect [of this situation] is that the Uzbek authorities are exploiting Yelena’s vulnerability: when they do not know how to force her to stay quiet, then they simply confine her to a psychiatric clinic. 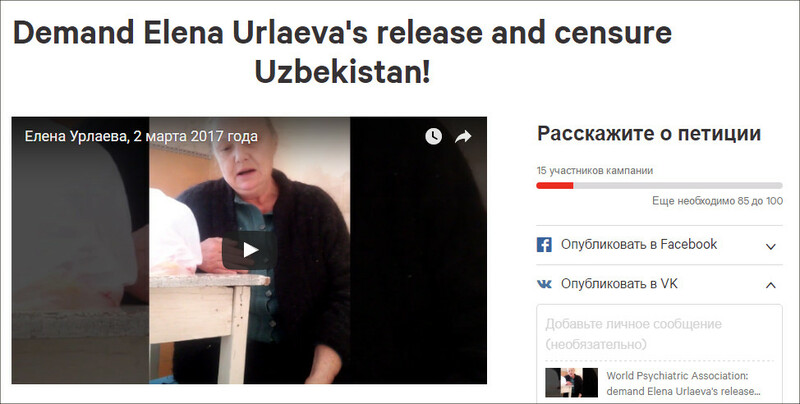 “We the undersigned strongly urge the World Psychiatric Association to demand that the government of Uzbekistan immediately release Yelena Urlayeva from forcible psychiatric detention, where she is being held in retaliation for, and in order to prevent her human rights activism. “Ms Urlayeva has been researching, protesting and advocating for human rights in her country since 1999. Repeatedly over the decades, in 2001, 2005, 2012 and 2016 the state has subjected her to punitive compulsory psychiatric imprisonment via court order, even though she has been found to be of sound mind. On March 1, police arrested her as she prepared a public protest as well as for a meeting with visiting officials from the World Bank and International Labour Organisation. She intended to present to them her first-hand documentation of human trafficking and state-organized forced labour in the cotton harvest. Police summoned an emergency psychiatric ambulance, which transported Ms Urlayeva to the Tashkent city Psychiatric Hospital, where she remains as of this writing.